the former Russian ambassador to the electoral court of Saxony, Count Kaiserling, who often stopped in Leipzig and brought there with him the aforementioned Goldberg [his house musician], in order to have him given musical instruction by Bach. The Count was often ill and had sleepless nights. At such times, Goldberg, who lived in his house, had to spend the night in an antechamber, so as to play for him during his insomnia. Once the Count mentioned in Bach’s presence that he would like to have some clavier pieces for Goldberg, which should be of such a smooth and somewhat lively character that he might be a little cheered up by them during his sleepless night. Bach thought himself best able to fulfill this wish by means of Variations, the writing of which he had until then considered an ungrateful task on account of the repeatedly similar harmonic foundation. But, since at this time all his works were already models of skill, these variations also became so under his hand. Yet he produced only a single work of this kind. Thereafter the Count always called them his variations. He never tired of them, and for a long time sleepless nights brought: “Dear Goldberg, do play me one of my variations.” Bach was perhaps never so rewarded for one of his works as for this one. The Count presented him with a golden goblet filled with 100 louis d’or. Nevertheless, even had the gift been a thousand times larger, their artistic value would still not have been paid for. — not to mention the miraculous quodlibet at No. 30, which entwines two popular German songs with the aria-theme. 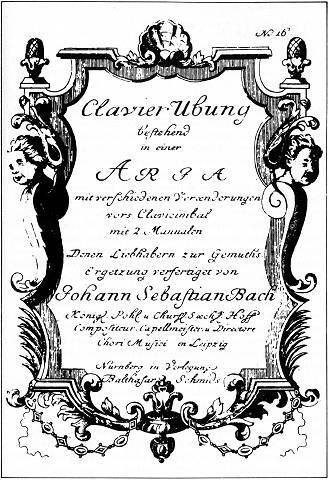 As is usual with Bach — and would later be demonstrated just as lavishly in his entirely canonic variations on the Christmas hymn “Vom Himmel hoch” –, the listener can choose between letting the head swim in the compositional problem of such a set of canons, and simply letting the ears enjoy the effortless-sounding musical effects that Bach produces by such intricate means. One person who certainly will not be inclined to sleep during the “Goldbergs” is their performer. Their complexity has sometimes brought into question whether the young Goldberg (barely fourteen at the time) was really the intended player. It seems likely that Bach wrote the set as thanks to its dedicatee, Count Kaiserling, for exerting his influence to get for Bach a court-composer post in Dresden (mentioned on the Goldberg title-page). The proffered post turned out to be of insufficient monetary magnificence to justify the abandonment of Bach’s whelming Leipzig duties, and that would surely have made the Count’s louis d’or all the more acceptable to the father of twenty children. We thus have here, in the Italian Concerto and the Aria with Variations, the two main Italian instrumental procedures of the day, transformed to new uses by the eighteenth century’s leading keyboard player, to the perpetual enrichment of humanity.